For almost four days, I spent almost my whole day at Masjid UI. It was full on Saturday, yet became empty on Monday and Tuesday. They had some classes, I thought. Every corner had a meeting. And the wind took me to sleep. So, I managed myself to draw some pics. 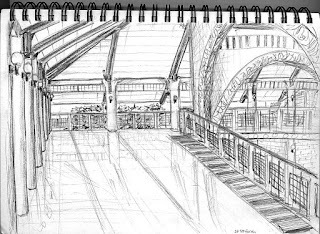 I'm not used to draw inside a huge building. I think it's hard to draw a fine line, with the perspectives, and add some elements. More practices in this holiday can do it, I suppose. What do you think? And what will you do today?